People have been struggling with missing teeth for hundreds of years, but only relatively recently has a truly transformative solution come to life. While some patients prefer older solutions, others often struggle with the loose nature and bulkiness of dentures and partials, as well as the inability of bridges to replace an entire set of missing teeth. It’s not a good idea to leave your smile riddled with unsightly gaps, though – not only can they hinder your enthusiasm and ability to interact with colleagues and peers, they can also cause a whole host of further oral health problems, such as an increased risk of gum disease and additional tooth loss. Thankfully, our team at Horsham Dental Elements is here to help with dental implants! These revolutionary tools can restore missing teeth seamlessly and provide your smile with much-needed sturdiness and functionality. They actually consist of multiple parts! First, once we’ve determined that you’re a viable candidate for the dental implants procedure, we’ll place a small, titanium post into the empty socket. Over time, this post will fuse with your natural jaw tissue, effectively becoming the “root” of your new tooth. Then, you’ll return to our office so that Dr. Henkel can finish it off with a beautiful, personalized crown. 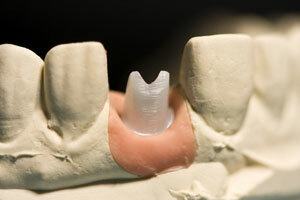 Here at our Horsham and Philadelphia offices, we rely on cone beam computed tomography to create 3D images as a guide for dental implant placement, which leads to more accuracy during placement and a much smoother procedure overall. Plus, Dr. Henkel is well-versed in the field of dental implants and will be sure to pass the countless benefits of his in-depth experience onto you! Contact either our Horsham or Philadelphia office today to schedule an appointment. Our team can’t wait to give you something to smile about with our committed and comprehensive dental care!